The 6th U.S. Embassy-Keio SFC-TOMODACHI Entrepreneurship Seminar took place from September 6-9, 2016. Funded by The Boeing Company, this program was developed to support young Japanese entrepreneurs who are interested in reconstructing and revitalizing the Tohoku community in the aftermath of the Great East Japan Earthquake. 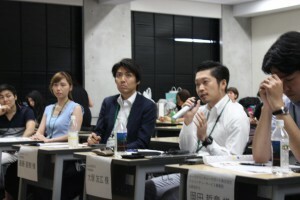 This year, 14 teams consisting of 37 university students from Niigata, Miyagi, Kumamoto and several other prefectures had passed the application process to participate in this four-day seminar. During the seminar, the students had the opportunity to improve and brush up on their business plans by obtaining advice and support from approximately 50 professional mentors and entrepreneurs. On the last day of the program, a committee judged and critiqued the business plans that were devised by the teams over the four days. Six teams with the best business plans were selected. On November 19, the business plans will be presented to a committee for final review. Until then, the students will continue to brush up on and improve upon their business plans. For the students who participated in the seminar, this program was an opportunity to encounter people they would not ordinarily meet in their community, and they were able to learn about entrepreneurship in a way that is not taught in a university in Japan. In addition, it allowed the students to meet fellow students with similar aspirations, as they discussed whether their plans and ideas would be of value for communities.